While some of the damage is being already addressed and will be resolved in a short time, other things will take longer. The Rector gave examples of the work ahead, “we need to redo the whole basketball court, the swimming pool [area], and the gymnasiums… And that can take some time [also] because it requires funds and [at this time] we aren’t sure what kind of funds we can rely on.” He noted that although the University has insurance, it “has its limits” and in regards to the government promising funding to schools and universities, it is still unclear how much that could cover. 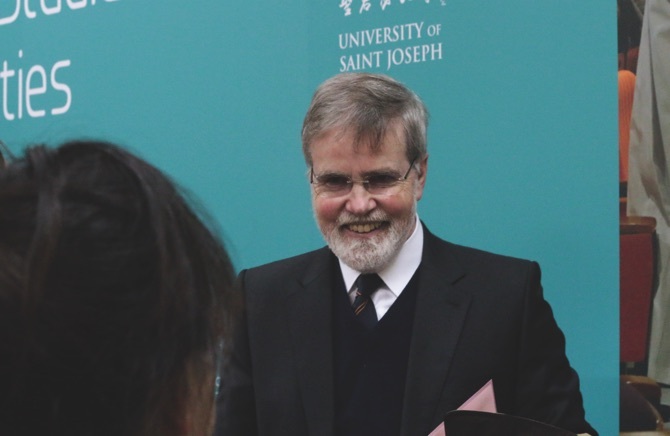 In an academic year that will see the USJ slightly increase the number of students, Rector Peter Stilwell said that one of the biggest challenges will be to use the new campus to start to establish a new culture in the university. For a long time, students and teaching staff had been spreading over different flats and different buildings, namely in the NAPE area, without a real campus where all people could really gather, share and bring new ideas together. The University is beginning this year with 355 new students; a figure that slightly surpasses the one from the previous academic year of 342 new students. The Rector also informed that besides the figures growing, it is also necessary to note that new students are enrolling more in Bachelor areas such as education and less in areas like Business where the University registered a very significant drop as there are high number of courses provided in Macau in this field. “As an institution, we have not [done] badly and we have seen an increase on the number of students that [is also followed] at the Masters level which is probably an area that we need to further develop in the future,” Stilwell concluded.